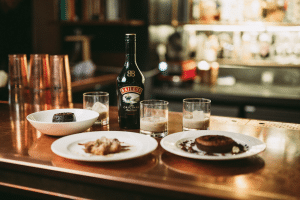 Wow your guests with a little help from Gordon’s and Baileys. It doesn’t matter if it’s your first time hosting or your fourteenth, the dinner party stress is real. But if you treat it like writing a book and get your beginning and your end sorted, the middle should just fall into place. With that in mind, we’ve come up with the ultimate guide to hosting New Year’s dinner for your mates with a little help from Gordon’s Dry Gin and Baileys. Make sure you’re organised with the pre-dinner snacks. Prepare some canapes to serve with your welcome drinks, which can be mini sandwiches, topped crackers or just go for classics like hummus, crisps and dips. Welcome your guests with a Gordon’s Sloe Gin sloe-secco. 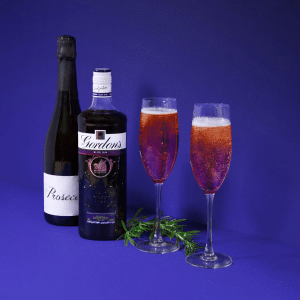 The cocktail is a modern twist on the traditional festive tipple Bucks Fizz, simply add 25ml of Gordon’s Sloe Gin to prosecco and serve in your best glasses. Crafted to balance the refreshing flavour of Gordon’s with the sweetness of raspberries and strawberries with the tang of redcurrant, Gordon’s Premium Pink Gin is a sweeter way to enjoy a G&T. Serve in a large wine glass, filled with ice and garnished with fresh strawberries. 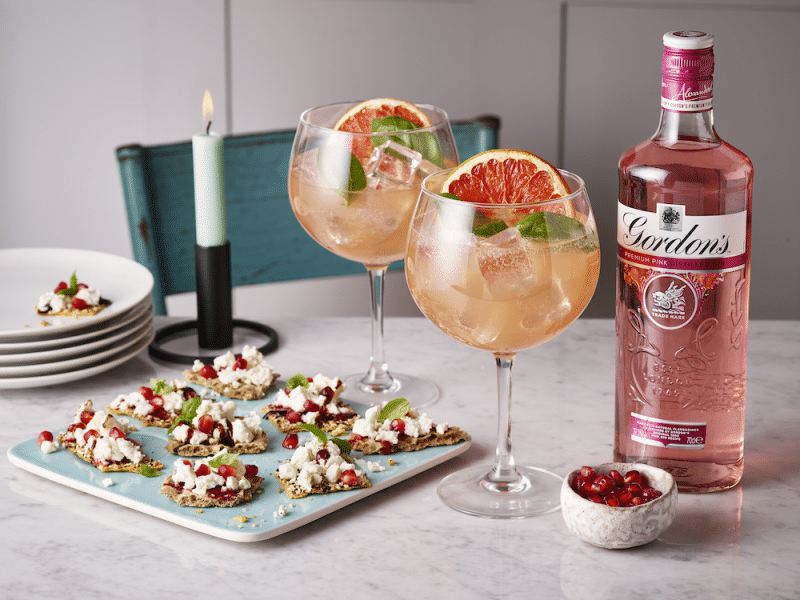 Or for something a little different, serve a Gordon’s Pink Spritz served in a fancy glass with ice, garnish with fresh strawberries and raspberries. The first drink before dinner sets up the meal to come, so cocktails served immediately before food should be something special to set the tone for the evening. 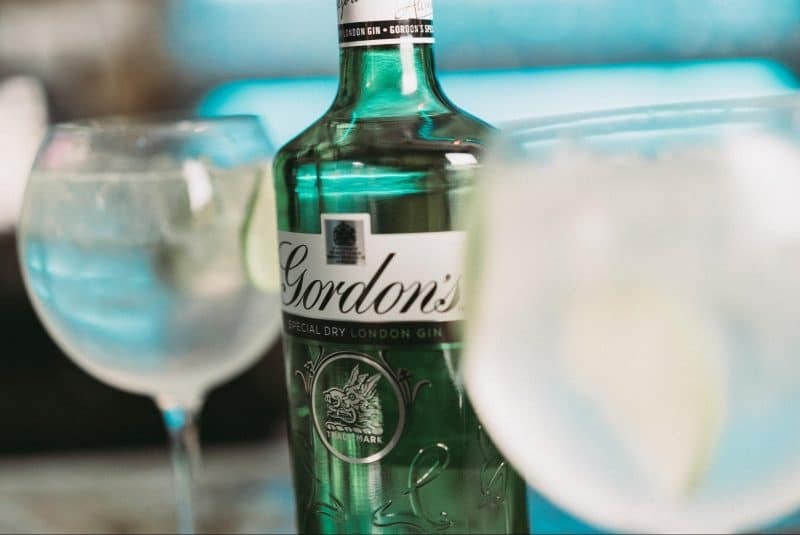 Gordon’s London Dry Gin is simply blended from four botanicals with a crisp taste, which makes it easy to pair with most food! Tonic water is the traditional go-to mixer for gin but luckily comes in loads of varieties. Mix up the classic ‘ice and a slice’ recipe by offering different flavours; from good old Indian and slimline to quirky aromatic and fruity infusions. Try 50ml Gordon’s London Dry Gin and 150ml tonic water, with wedges/slices of your favourite garnish (or cucumber for a fresh, cool finish). Hosting any dinner can be scary, be it New Years, a birthday or just a Sunday lunch, but it doesn’t have to be. The right menu and a bit of forward planning can turn a first-time entertainer into the host(ess) with the most(ess). Keep things simple to start with soup and bread rolls you can bake in the oven, this will give you more time to focus on the main course. Impress your guests with this melt in the mouth seven-hour lamb. Don’t be put off by the long oven time, it only takes fifteen minutes to prep and means your guests will be greeted by the mouth-watering aroma of roasting lamb. Or if you’re pretty confident in the kitchen, reject the roast all together and wow your guests with a beef wellington. Get the best piece of beef you can afford, preferably from your local butcher, and don’t worry about making your own pastry. Even top chefs use the ready-rolled stuff! The trimmings are completely up to you (but if you don’t have pigs in blankets you’re just not right). Make life easy for yourself by chopping and preparing your veg and par-boiling your potatoes (boil for 10-15 minutes) the night before. And for your veggie friends, try this super festive cranberry and lentil bake. It only takes five minutes to prep and can be served with all your Christmas vegetables. If you’re worried about time you can make it up to two days before serving and double or triple the quantities to serve more people. 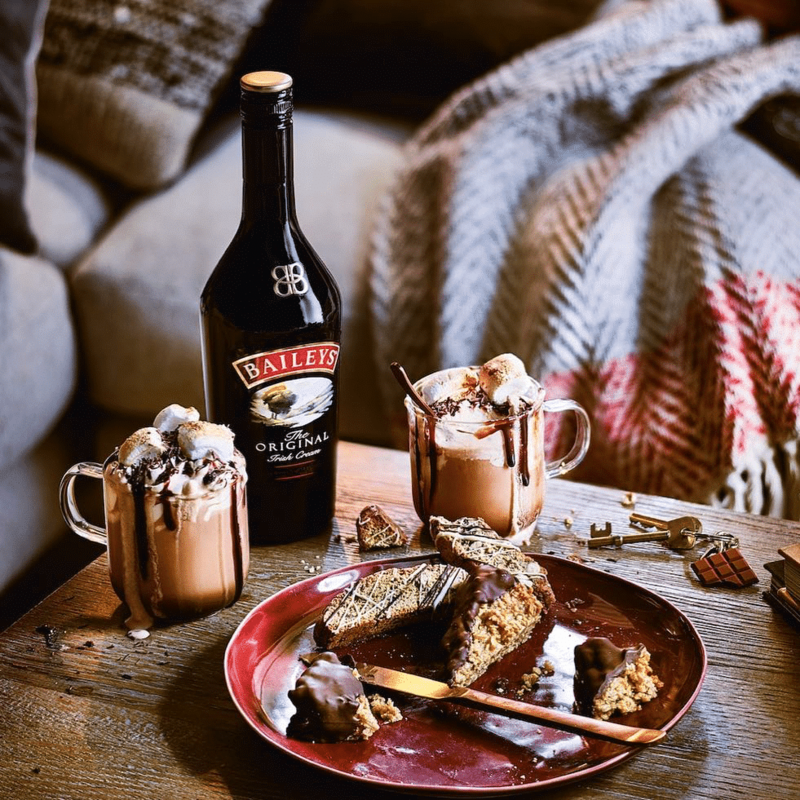 Show your vegan friends you’ve thought of everything and follow their meal with a Baileys Almande over ice. The vegan-friendly drink promises all the deliciousness of Baileys without the dairy and is the perfect addition to any vegan meal. After the roaring success of your dinner, it’s time for pudding. This could be mince pies, sticky toffee, or maybe you’ve gone all out and made a Christmas pud. 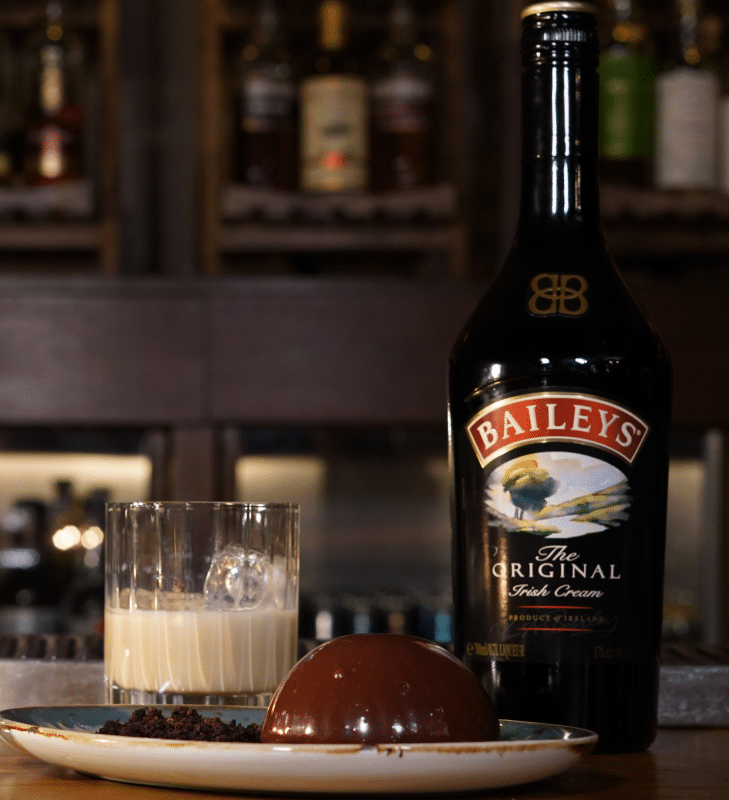 Regardless of the dessert, we always serve it with Baileys! The smooth velvety texture is the perfect combination of cream and whiskey and can be enjoyed on its own, on the rocks or as part of an after-dinner cocktail – try a creamy white Russian or an indulgent chocolatini. Get creative and do some Baileys-based baking if you want to be able to throw out impressive *hair flick* “Oh, these? Just something I put together earlier” levels of sass. Try these Salted chocolate Baileys truffle squares with gold edible glitter. We’re also a big fan of these Mini banoffee Baileys pies or, go all out with this recipe for a Baileys Christmas pudding with Baileys syrup. If you’re looking for something to counteract the chill as the cold nights close in, Bailey’s hot chocolate is the perfect winter warmer. Or if you fancy something a little bit less sweet, treat yourself to a luxurious Baileys coffee or a creamy Irish latte.